Deleting an image can also be done when in image edit mode by clicking the 'Delete Image' button in the lower left corner of the pop-up and then clicking 'Yes' to confirm. Coding PDFs is essentially the same as coding other documents, bu with the added feature of being able to code either as text or as an image. The first thing you may notice when you open a PDF in Dedoose is the added functionality at the top of the document. There is a page selector, buttons for moving forward or back a page, the selection mode, and a zoom bar. The page selector helps you jump to a page within the document. Type the page number you wish to see in the box and hit enter and you'll be taken directly to that page. Alternatively, you can move either one page forward or back with the arrow buttons. Make sure the selection mode is set to 'text. Using your cursor, highlight a segment of text you wish to code. You can either use the quick code widget by hitting the space bar or simply double click on the code in your code tree to create the excerpt and apply the tag. Using your cursor, highlight a portion of the image you wish to code. You can then either use the quick code widget by hitting the spacebar or simply double click on the code in your code tree to apply. Adjust until the image is displayed at the desired size. The Media Workspace is where your media files are stored and you can find features to sort and manage these data. Click the Import Data button in the upper left panel of the project's Home Dashboard. If you select a single text file, you will be taken directly to that file in document view within Dedoose. If you select multiple text files, you will see a Success pop-up that indicates your documents have been uploaded. For audio and video files, you will see a progress bar and then get a pop-up after the import indicating that the file has been added and is being processing in the background. You can continue to work elsewhere in Dedoose while this occurs, and when the file finishes processing, you will get a pop-up notifying you that it has completed. Finally, please keep in mind that the process of video files can take some time depending on the queue on our servers for processing these routines. TIP: When first uploading documents, it is often most efficient to immediately establish link(s) to descriptors, if appropriate, so these important relationships are not neglected. However, this may not always be possible if descriptor data have not yet been created. In any case, these links can be established or changed at any time by click the 'Descriptors' button. Click 'Submit' and the document will then be presented in document view and is ready for viewing, excerpting, and linking to descriptors (if necessary). The Media Workspace has features for sorting your media files, customizing column views, and filtering by sub-group using Boolean operators. Using these features can be a quick way to locate or review sets of media files in your project. Using these features can be a quick way to locate or review sets of media files in your project. Open these folders in the Filtering panel and click the “Positive Change” and “Full Time” check boxes to filter your media files to just this subset. Filters can be cleared by clicking the Clear Filters button at the bottom of the panel. We call this tool our SuperMegaGrid and you'll see these filtering features in some other Dedoose Workspaces and in the Data Selector. The Document Viewer allows you to browse the text, create and code excerpts, search for text, line number, or character location, and manage all aspects of the document. There are a variety of controls for how you can view and work with your document. Font size can be adjusted (see control in lower left corner of document view). Information on document creation date, creator, and number of excerpts is noted in document header along with buttons to create and link memos to the document and create and/or link descriptors. Cloning - a document can be copied so that all the excerpt and codes are copied along with it. This is a useful feature for comparing coding decisions across team members. To do so, excerpt a document with no coding. Clone document for each team member and re-title each accordingly. Each team member can then apply codes independently for later comparison. The magnifying glass icon in the upper right corner of the document panel provides access to your search tools. To search for a keyword or text string, enter the text and click 'Submit' Dedoose highlight all words with that string and allows you to move among the 'hits' using the 'Back' and 'Next' buttons. These following screenshot shows the search tool icon and pop-up. In this example we searched for 'reading' and the results show that there were 21 matches and each match highlighted in pink so you can easily move through your document to locate this text in context and conduct any appropriate excerpting, coding, and memoing. The search tool pop-up is a movable panel (just drag and drop the panel header), and also allows for searching by character position and line number. In the Settings panel in the document viewer, located in the upper left, there are a few functions to control how your work is presented. Color Scheme: This will allow you to change what colors are present in your excerpting and, perhaps, what meaning you have assigned to them. By default, Dedoose will automatically cycle through a set of colors as you create excerpts. However, you can choose colors to correspond with particular codes or set the system to display certain colors for certain users. This is just one more feature to help keep things displayed in a way that's most meaningful to you. The audio and video viewer allows you to watch and/or listen to your media, create and code excerpts, create transcripts, and manage all aspects of the file. The video viewer looks the same as the audio viewer above except a video will be shown in the primary viewing area. There are a variety of controls for how you can view and work with both your audio and video files. Zoom in and out on the timeline with the slider in the lower left. The viewing panel will also have the name of the video along with a button to create and link excerpts, memos, and descriptors. You can also view the number of memos and descriptors that are currently linked to the file (shown in the screenshot above). Deleting Transcript - click the 'Delete Transcript' button to remove the transcript from your file, and yes, you will also get a warning to confirm. Click 'Save' button in the lower right corner of the transcript panel...this is one of the few places in Dedoose where you have to actively save. When finished, make sure to hit the 'Save' button in the lower right corner of the transcript panel. Finally, note that the transcript editor is always active for modification. The 'End' marker will automatically adjust as any editing within the boundaries of an already synchronized portion of text takes place. Upon creating or importing a media file to Dedoose, note that it is not yet linked to any descriptors. This is indicated through the red-colored 'Descriptor: 0' button in the upper-right corner of the media viewer. 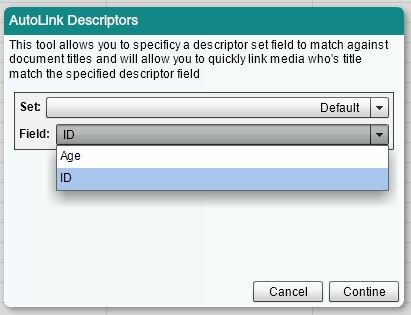 To create the relationship between the media file and associated descriptor data, click this red Descriptor button to open the linking pop-up. Clicking the 'Link' button for the appropriate descriptor establishes this relationship. In the example below, the document has been linked to the descriptor with ID = '7.05' As an alternative, you can also click the 'Create and Link Descriptor' button in the lower right corner of the pop-up if the data for the particular case has not yet been added to the descriptor set. Descriptors can be automatically linked to media files given a column with the document titles exactly as they appear in Dedoose. This will need to include any format in the name, for example sample.docx will need .docx in the field value. Descriptors can be linked and unlinked to media files at any time. It is suggested, however, that this relationship be established when submitting media files to the system or as soon as possible when data are available in the system, as many Dedoose analysis features draw upon these relationships.